Concord Massachusetts Bed & Breakfast, the Concord's Colonial Inn. Concord's Colonial Inn has 56 charming guest rooms, each individually appointed in the Colonial style and with wireless access. For extended stays, we offer spacious one, two and three-bedroom suites, apartments and private houses. Our authentic New England setting, excellent cuisine and flexible meeting rooms make Concord's Colonial Inn an ideal location for corporate events, weddings, or other social functions for 10 to 100 people. Delectable seafood and New England fare are served in our traditional dining rooms, and nightly entertainment is offered in the Village Forge Tavern. View the interactive map on our website and learn more about area attractions such as Walden Pond, the Old North Bridge, the homes of Ralph Waldo Emerson and Louisa May Alcott, and more. 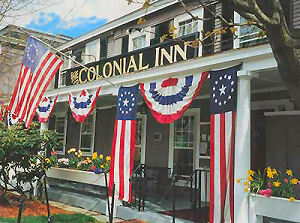 Concord's Colonial Inn is listed on the National Register of Historic Places and is a member of Historic Hotels of America.